Ms. Coburn’s 2018-2019 season begins by returning to the role of Rosina in Il barbiere di Siviglia with Tulsa Opera. Additionally, she sings Marie in La fille du regiment with Opera Carolina. Last season began with a role and company debut, as the title role in Manon with Opera Santa Barbara. Her season also included concerts with tenor Lawrence Brownlee at both the Tivoli Festival and with the Copenhagen Philharmonic, Rossini’s Stabat Mater with the Choral Arts Society of Washington led by Antony Walker, and Mahler’s Symphony No. 4 with the Tulsa Symphony Orchestra. In the 2016-2017 season Sarah Coburn returned to Seattle Opera as Adèle in Le comte Ory, a debuted with Opera San Antonio as Rosina in Il barbiere di Siviglia, and sang Konstanze in Atlanta Opera’s production of Die Entführung aus dem Serail. The previous season saw her perform in concert with the Cincinnati Chamber Orchestra, Oklahoma City Philharmonic, and with the Tivoli Festival. Recent highlights include the role of Amina in La sonnambula with the Wiener Staatsoper, Zerbinetta in Ariadne auf Naxos with Seattle Opera, Marie in La fille du regiment with Seattle Opera and Tulsa Opera, Juliette in Roméo et Juliette with Tulsa Opera, and Adina in L’elisir d’amore with Washington National Opera. Ms. Coburn has perfomed the roles of Princess Yue-Yang in the world premiere production of Tan Dun’s The First Emperor at the Metropolitan Opera opposite Placido Domingo, Rosina in Il Barbiere di Siviglia with Florida Grand Opera, Los Angeles Opera, Tulsa Opera, Seattle Opera, and Boston Lyric Opera; the title role in Lucia di Lammermoor with Washington National Opera, Tulsa Opera and Utah Opera; Gilda in Rigoletto with Welsh National Opera, Opéra de Montréal, Los Angeles Opera, Portland Opera, Arizona Opera, and Cincinnati Opera; Asteria in Tamerlano with Washington National Opera and Los Angeles Opera; Vittoria in Pedrotti’s Tutti in maschera at Wexford Festival Opera, Euridice in Haydn’s L’anima del filosofo with the Handel & Haydn Society and Glimmerglass Opera, Elvira in I puritani with the Tivoli Festival, Boston Lyric Opera and Washington Concert Opera, Lakmé with Tulsa Opera, Lucie de Lammermoor with both Cincinnati Opera and Glimmerglass Opera, Linda di Chamounix at the Caramoor Festival, and Giulietta in I Capuleti e i Montecchi with Glimmerglass Opera. Ms. Coburn has also performed with Glimmerglass Opera as the title character in Gilbert and Sullivan’s Patience as well as Sister Constance in Dialogues of the Carmelites, a role she reprised for New York City Opera. “Coburn seems to have it all – beauty, silvery high notes and fearlessness when tackling the most treacherous cascades and runs. That was most evident in her selections from the Italian “bel canto” tradition in the program’s second half. “The two opening-night stars, tenor Lawrence Brownlee and soprano Sarah Coburn, cast the best possible light on Seattle Opera’s Young Artists program (both are alums). It would be hard to find two singers anywhere who could do more credit to these roles. Brownlee, at the international top of his form, sings his highflying arias with an ease, purity and polish that could hardly be bettered. He is thoroughly at home as the lovestruck Tonio, who joins the regiment to woo its adorable mascot Marie (Coburn, whose coloratura voice has gotten bigger but has lost none of its lovely agility). Both are singers are vital, winning actors and fun to watch; the opera’s two acts seem to fly right by. Coburn brought sweet vulnerability in her role debut as the ingénue Sophie. The presentation of the rose scene was radiant, and her voice had silvery beauty all the way to her stunning high notes. Please contact Fletcher Artist Management for audio. 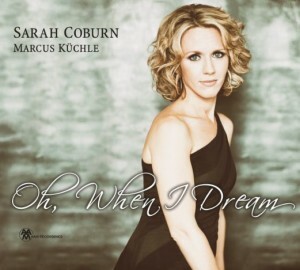 Sarah Coburn’s new album, “Oh, When I Dream” is now available for purchase on Amazon! For more information and to buy, click HERE.